Language:English and Palauan are official in all states except Sonsoral (Sonsorolese and English are official), Tobi (Tobi and English are official), and Angaur (Angaur, Japanese and English are official). Area:Land 488 km². Freshwater n.a. Exclusive economic zone 629,000 km². Terrain: Varying geologically from the high, mountainous main island of Babeldaob to low coral islands usually fringed by large barrier reefs. Climate: Wet season is May to November. Generally hot and humid. Average annual temperature 27°C. Rainfall average 150 inches. Average relative humidity 82%. Geography: Westernmost archipelago in the Caroline chain. Consists of six island groups totalling over 200 islands. Includes World War II battleground of Beliliou (Peleliu) and world-famous rock islands. Economy: Important industries are tourism, construction, craft items, fishing and garment making. Export commodities include trochus, tuna, copra and handicrafts. The Micronesian Mariculture Demonstration Center (MMDC), later to be renamed the Palau Mariculture Center (PMDC), was established in the early 1970s. The MMDC was one of the first institutions to suceeded in mass production of giant clams. 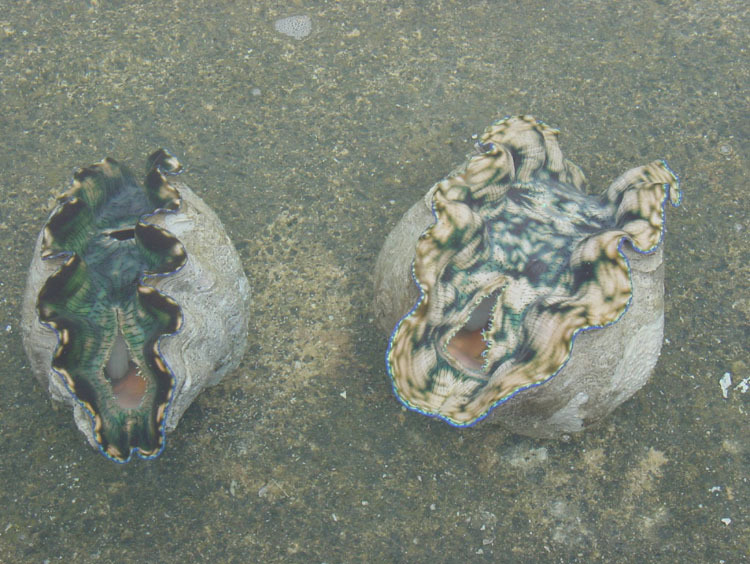 Many countries in the Pacific were recipients of Palau cultured clam broodstock which they subsequently utilised in thier own giant clam projects. Milkfish farming using fry from the wild was attempted by private entrepreneurs. With the development of the pole-and-line tuna fishery, demand for live bait increased when natural bait stocks were low. Mollies or the top minnow (Poecilia vittata) were cultured at MMDC with assistance from the Trust Terrirtory and University of Hawaii Sea Grant Program. Fishing trials to determine the effectiveness of the new bait followed successful production of topminnows. Trial results were higher than those at American Samoa. It proved superior over natural bait in bad weather, when tuna are further away from the shore and when natural bait stocks are scarce. Top minnows could be successfully cultured in Palau but the decline of the fishery and abundance of natural bait in the lagoons led to the end of molly cultivation. Oyster farming was considered, utilising the local species Crassostrea echinata, but required further research. Experimental farming of oysters on rafts and racks was initiated with imported spat of C. gigas from California. Trials were conducted twice with imported C. gigas spat but were not successful because of difficulties related to costs of the culture system, equipment, inconsistent growth rates, natural disasters and vandalism. C. gigas, however, was reported to be fast growing (reached market size in one year, but spat mortality was high from handling) and better quality than the endemic species. C. echinata was cultured in a village farm and harvested by local families for domestic sales. Mikimoto started experimental pearl farming in Palau in 1920 using the local black lip oyster Pinctada margaritifera and later imported gold-lip pearl oyster P. maxima. Pearls were exported from Palau during the 1930s by four companies controlled mostly by the Japanese. At the outbreak of World War II pearl farms were abandoned. In 1983, two pearl farms were in operation, owned by locals and employing Japanese technicians. Oysters cultured were mostly P. margaritifera. Experimental trials were carried out on the winged oyster Pteria penguin. A hatchery for the culture of the indigenous giant freshwater shrimp (Macrobrachium rosenbergii) was established at MMDC an economic analysis revealed that larger ponds, 8 ha, would be more profitable in terms of breakeven point than smaller farms. Prawns were successfully spawned and raised but several difficulties terminated trials at MMDC relating to intermittent shortage of freshwater and personnel, high cost of production of post-larvae and minimal interest from the private sector. Rabbitfish were cultured in response to a recommendation by an FAO consultant D.K. Villaluz and also through a request by local fishermen to replenish dwindling wild stocks. Rabbitfish Siganus canaliculatus and S. lineatus were successfully spawned and reared to fry stage at MMDC. The economics of production and farming of rabbitfish were expensive and MMDC was not able to finance this project. Sponge farming was reported to have been carried out by the Japanese. Trochus cultivation was one of the activities at MMDC. The project was funded by the Pacific Tuna Development Foundation (PTDF) in the early 1980s. Trochus cultivation techniques were examined as well as the monitoring of released seed in the wild. A local businessman initiated turtle farming in Palau. Disease blinded and killed some of the turtles. Government re-activated turtle farming in response to deteriorating wild stocks in 1971, utilising a small-scale hatchery at MMDC. A hawksbill turtle headstart program was reactivated in 1981 by government and released 800 juveniles with 80% hatching success. Aquaculture development in Palau has been revived with a particular focus on its application to rural areas. The government is currently involved with the FAO in a joint project looking at factors affecting coastal resource management and the application of aquaculture. 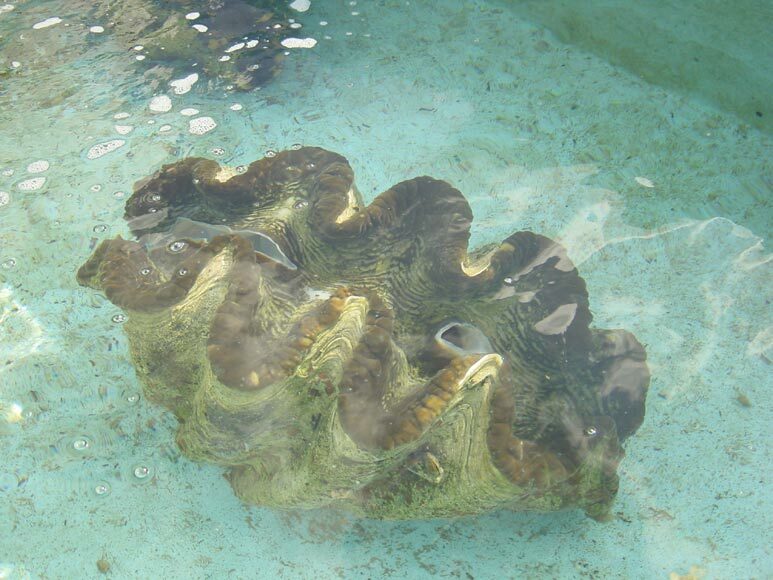 Giant clams remain the main aquaculture product of Palau. These clams are raised in the government aquaculture centre.